Waste reduction is a major component of our work at Asheville GreenWorks. Since 1973, our staff and volunteers have worked to educate and reduce our dependance on one-use, so called "throw-away" items that simply fill up our landfills. Through recycling and compost education, we will reduce our need for landfills and through these innovations support infrastructure for future green industries. 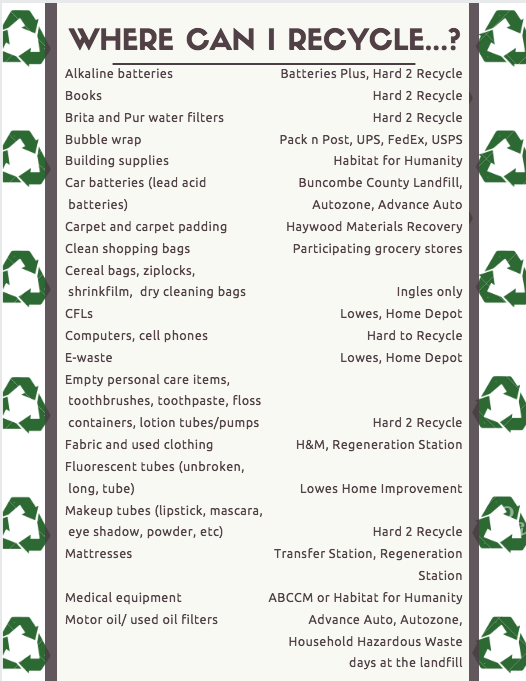 If you would like to learn more about recycling in Asheville and request a recycling presentation to your neighborhood group, please email Julia@ashevillegreenworks.org. Packaging peanuts & Bubble wrap - Pack-n-Post, UPS Stores (bubble wrap only), U-Haul provides a "take a bag, leave a bag" program for packing peanuts at all corporate locations. For a more complete list of where to recycle items, download the printer-friendly document above. MOVING BOX EXCHANGE program: Drop off your flattened boxes. If you are in need, please stop by and take as many as you need. This is a great service to help reduce cardboard wastes in our landfill. Hazardous waste and e-waste is accepted some Fridays from 9am-3pm. Call for more information. Buncombe County Residents are allowed to bring up to 10 tires (without rim) to the County Landfill a year, FREE OF CHARGE. All tires on a rim will incur a $2.00 per tire disposal fee. The Buncombe County Transfer Station is now offering tire recycling. Fees may apply. Can be recycled at the Buncombe County Landfill or all Lowes and Home Depot Stores at no charge. Curbside Management servicing Western North Carolina and parts of upstate South Carolina. Live in the City of Asheville? Contact Curbside if you need to request a new Blue Container, Request for pickup or find out your neighborhood's pickup day. Click here for a list of "What Can I Recycle?" Biltmore Iron & Metal Co. is dedicated to responsible and environmentally safe operating procedures and practices through compliance with all applicable local, state, and federal environmental laws and regulations. Biltmore Iron & Metal Co. is committed to maintaining an environmentally sound workplace as demonstrated by our adoption of industry developed, comprehensive environmental operating guidelines. 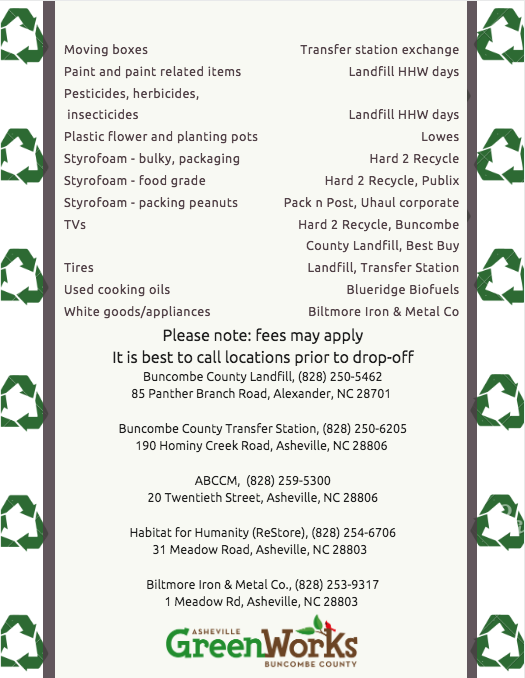 Biltmore Iron & Metal Co. supports "Design for Recycling", a national policy to promote the design and manufacture of goods that, at the end of their useful life, can be recycled safely and efficiently. Danny’s Dumpster is an independent commercial compost and recycle hauling company in Western North Carolina. We specialize in waste reduction by offering businesses responsible disposal options and enabling them to affordably and efficiently transition their waste stream from landfill debris to renewable resources. Think of composting like this: “if it was ever alive, it can be composted”. Biodegradable doesn’t mean something is compostable, it just means the item will degrade into its base compounds through environmental influences. We utilize in-vessel, forced air commercial composting to take food waste from plate to top-soil in 4 months. Servicing 120 area restaurants, businesses, schools, hospitals and diverting 35 tons of food waste each week from the landfill. ​CompostNow brings the efforts of our members full circle by helping them share compost with local community gardens and urban farms, keeping this natural resource circulating in our community (we call it nutrient cycling). We hope to see every household and business composting and diverting their food scraps from landfills and into compost for gardens and farms. Our aim is to continue lowering the barriers associated with composting, find and implement effective ways to reinforce the environmental, social, and economical benefits of compost(ing), and--at the same time--build a lasting, profitable organization that empowers its employees and customers. The Cooking Oil Recycling Program is a pilot project for providing used oil recycling services to Asheville and throughout Western North Carolina. Funded by the Biofuels Center of North Carolina, the COR Program is the first of its kind in the region, and provides recycling services previously unavailable in our local communities. Did you know that fuel can be made from used cooking oil? The Metropolitan Sewerage District of Buncombe County, in collaboration with Blue Ridge Biofuels and Green Opportunities, are working to keep used cooking oils and greases out of the sewers and landfill and divert them into biodiesel production to be sold back to the local community as clean, renewable fuel. Recycling your used cooking oil creates jobs, reduces waste, improves air quality, and creates clean energy in our local community. You can be a part of the local fuel economy simply by recycling. Locally-made recycling bins for used cooking oil are placed throughout Buncombe County and Western North Carolina. Visit our bin location page to find your nearest recycling bin and for information on how to get involved with the Program. It takes an active involvement to create sustainable communities. Have questions about recycling? Want to become a Program Partner? Have a good idea for a bin location? Let us know how we can make the Cooking Oil Recycling Program better. Start your own Recycling program. Outsmart Waste! TerraCycle’s goal is to help eliminate the idea of waste. We do this by creating collection and solution programs for all kinds of typically non-recyclable waste. In essence turning the non-recyclable recyclable. We do this by creating waste collection programs, “brigades,” and turning the collected waste into new products, ranging from recycled park benches to upcycled backpacks. TerraCycle operates all around the world so please check out if we are available in your country. To start collecting please sign up and join a brigade. There are brigades for many different waste streams ranging from candy wrappers to pens. While some brigades have a cost many are free, where we pay the shipping and for every unit of waste you send to us and at least $0.02 to a charity or school of your choice. If you have already signed up, or are interested in signing up, you can download our free Collection Kit to get started.